Select from the options described below. Complete a Guided Tour Reservation Request or Self-Guided Visit Reservation Request. Requests must be received at least four weeks prior to your preferred dates. You will generally hear back from Group Sales within two business days. Once confirmed, prepare for your visit with a downloadable checklist, map, and information for chaperones. Want to know more before booking? See Choose Your Experience and Admission and Payment for additional information. Teachers are invited to visit the MFA with their class for a self-directed experience. Students explore the galleries at their own pace with chaperones and can complete prepared assignments. Download and print the MFA’s self-guided visit activities to enrich your students’ visit. Mobile MFA Guides are also available for rent. Please refer to Protecting Visitors and the Artwork for guidelines on gallery capacities and other relevant information for all chaperones. 10 am to closing, every 15 minutes. Mondays–Thursdays 11 am to closing, every 15 minutes. Fridays–Sundays 10 am to closing, every 15 minutes. Henri de Toulouse-Lautrec (1864–1901) captured the spectacle of modern Paris in evocative posters, prints, and paintings. This exhibition explores his depictions of the stars and entertainments of Montmartre, a neighborhood of heady bohemian pleasure. See the changing artistic and social landscapes of Paris – scenes of the city by day and night; cafés, cabarets and theaters; and celebrities of the age. Organized by the MFA in partnership with the Boston Public Library, the exhibition draws on both institutions’ rich holdings of graphic works by the artist. The Discovering the MFA tour is ideal for first-time visitors or classes interested in a cross-cultural approach to art. Explore a variety of objects from across the Museum’s major collection areas, in different media throughout the ages. Students will look closely and discuss works of art in a fun and engaging way. This tour offers an introduction to the Museum for early childhood grades, using the lens of “collections” as a means of learning more about museums, and specifically the MFA. The Museum is comprised of collections, from all of the artworks housed within the Museum to individual galleries and displays. Through this tour, students gain a deeper understanding of how museums function as collections and are able to apply this knowledge through developmentally appropriate gallery activities and discussions. This cross-collection tour is designed specifically for Spanish language students learning about the rich cultural heritage of the Spanish-speaking world. Students explore works from medieval Spain through colonization in the Americas to the 20th-century, up to the diverse work of contemporary Spanish-speaking artists. Students encounter original works of art by Velázquez, Kahlo, Picasso, El Greco, and more. This tour is conducted in English. After viewing portraits of people from around the world, students create a self-portrait inspired by artists like Velázquez, Kahlo, or Picasso. The Highlights tour offers an overview of the art of North, Central and South America in the Museum’s Art of the Americas Wing. The collection ranges from art of the ancient Americas to artwork made in the first half of the 20th century. Students look closely at paintings, sculpture, decorative arts, and other objects to learn how artists use the elements of art to create meaning and how art reflects the time and culture in which it is made. This tour is recommended for grades 3-12. This tour illustrates the events of the 1800s and early 1900s and how they shaped how Americans perceived themselves. Students explore the impact of industrialization, westward expansion, the Civil War, immigration, and the American role in international relations. They see examples of painting, sculpture, and decorative arts from the time period that reflects those changes. This tour is recommended for high school classes studying United States history and culture of the 19th and 20th centuries. Our country’s unique identity is comprised of languages, food, fashion, style, art, and music from many cultures. Students mix images from print with acrylic paint on canvas to create their own artwork. This tour offers a chance to explore the earliest art of the Americas. Portraits, furniture, silver, and gold tell stories about life in ancient Mesoamerica, colonial North America, Native American communities, and the new nation. This tour is recommended for students in grades 3-12 who are interested in the history and culture of the Americas through the early 19th century. Artists across time and cultures in the Americas used clay to make practical, beautiful vessels to carry water and store food, developing different designs and images for decoration. Students build clay objects in the style of Native Americans or the early colonists. The Massachusetts tour provides a window into the American Revolution and daily life for colonists and patriots in the 17th and 18th centuries. Students visit period rooms from both rural and urban houses and become familiar with everyday objects. Students also see paintings of Revolutionary leaders and the events with which they are associated. This tour is recommended for students in grades 3-12 who are interested in the history and culture of Massachusetts. After viewing portraits on the tour, students paint their own self-portrait. Students consider what they can communicate through their portrait through their choice of pose, setting, clothing, and attributes. This tour offers the opportunity to see objects from the ancient world up-close. Students engage with sculpture, metals, and ceramics from various ancient cultures. The tour may include an exploration of works of art from Mesopotamia, Egypt, Greece, and Rome. This tour is recommended for grades 3-12. Students create their own clay vessels inspired by Mesopotamian or Mediterranean cultures. The MFA’s Egyptian collection is one of the largest and most comprehensive in the world. The Art of Ancient Egypt tour introduces students to this remarkable ancient civilization. Students explore what the Ancient Egyptians valued and believed by examining depictions of pharaohs, artifacts from daily life, and funerary objects including mummies. This tour is recommended for elementary and middle school classes studying Ancient Egypt. The ancient Egyptians were well prepared for their trip to the afterlife. Students create in clay a favorite object they would bring to the afterlife. Look closely to learn how art reflects the time, culture, and religions in which it was made. This Highlights tour offers an overview of the art of Asia on view at the MFA: India, China, Korea, and Japan through Islamic, Buddhist, and Hindu art, as well as a range of secular objects from as far back as the 13th century BC to the present day. Note: due to ongoing changes in the galleries, we are not offering the Art of China and Art of Japan tours during the 2018–19 school year. You may request additional emphasis on one of these collection areas during your Highlights of the Art of Asia tour. This tour is recommended for grades 3-12. Students use clay to make a decorative object or sculpture inspired by the culture, religion, or time period of one of the regions they just explored. See how trade transformed cultures, bringing Buddhism to “the east” and Chinese style to “the west,” while examining objects reflecting the wide variety of people, animals, goods, artistic styles, technology, cultures, and religious beliefs of the Silk Road at its zenith in 1500 to 1600 BC. With mixed media and collage, students make an illustrated map of their travels, including places, objects, cultures, temples, and palaces. The Small Kingdoms to Emerging Nations tour includes 12th through 17th century art reflecting how European culture acquired practices and forms rooted in church and state. Students look at and talk about paintings, sculpture, and decorative arts from this time period such as princely portraits, luxury goods, monks, and stories from mythology. Inspired by 12th-century paintings, students paint a tempera panel in bright colors and gold paint. The Enlightenment to Modernism tour includes 18th through mid 20th century art illustrating the emergence of modern Europe through art that reflects this time period. Students look at and talk about sculpture, decorative arts, and paintings—including the MFA’s unparalleled Impressionist collection. Students look at 18th-century sculpture, then build a clay bust of a current important figure in the manner of 18th century busts, create a self-portrait, or a bust of a friend. The French Art tour includes 17th through 20th century art, covering a number of artistic styles, including but not limited to Classicism, French Rococo, Romanticism, Impressionism, Post-Impressionism, Pointillism, and Cubism. Students discuss socio-political factors and the influence of other cultures on French art. This is an English language tour. Original Cubist works serve as inspiration to create Cubist assemblages or paintings. 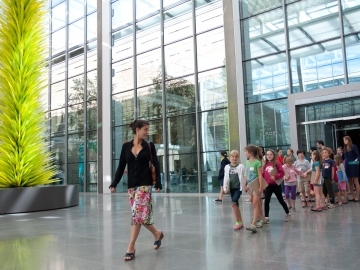 This two-part program combines a guided tour with a related art-making activity. The first hour is a guided tour you select, led by a Gallery Instructor. In the second hour, a Studio Art Instructor encourages students to reflect on what they saw in the galleries and make their own work of art to take home. Activities are designed to help students better understand the creative process and include working with clay, painting on canvas, collage, or ink brush painting. Submit a Guided Tour Reservation Request. Choose the What Artists Do component for an additional $8 per student. Note: this cost is not covered by the MFA’s waived admission programs. What Artists Do is available for groups of up to 60 students. Enrich your visit with a Self-Guided Visit Activities that give students (and their chaperones) opportunities to explore the MFA with a focus.